This species was described by Blanco in the second edition of his Flora de Filipinas (1845) and named after the island group. Madulid, D. A., C. Villariba-Tolentino, and E. M. G. Agoo. 2006. 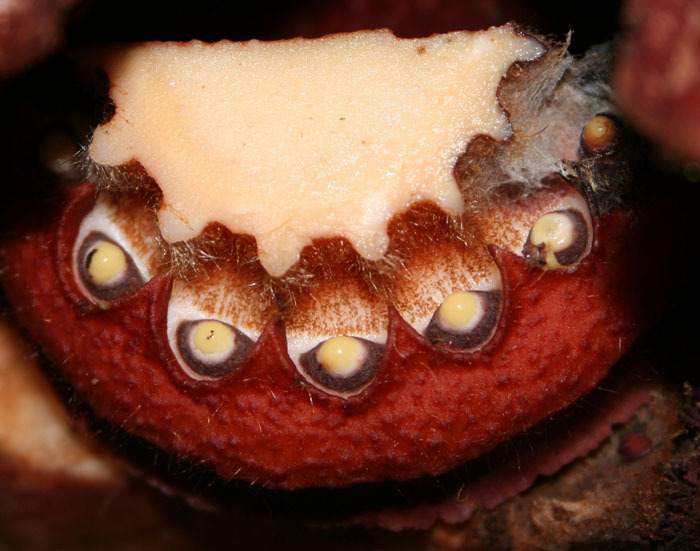 Rafflesia banahawensis (Rafflesiaceae), a new species from Luzon, Philippines. Philippine Scientist 43: 43-51. Barcelona, J. F., P. B. Pelser, and M. O. Cajano. 2007. 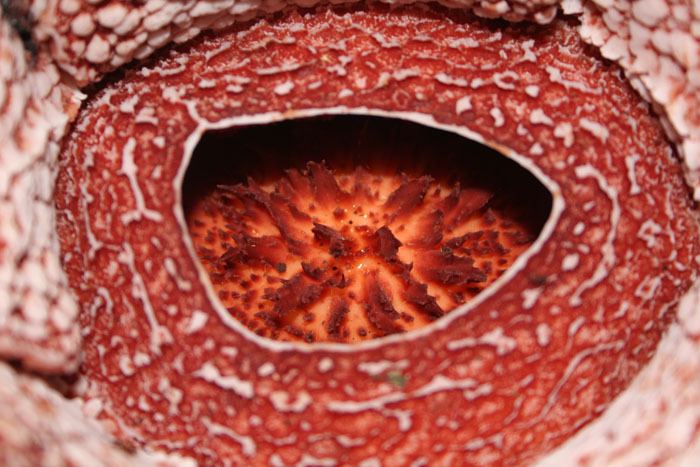 Rafflesia banahaw (Rafflesiaceae), a new species from Luzon, Philippines. Blumea 52: 345-350. Rafflesia philippensis is known from only five locations on Mt. Banahaw on Luzon. The species grows on Tetrastigma roots at or below the ground level. 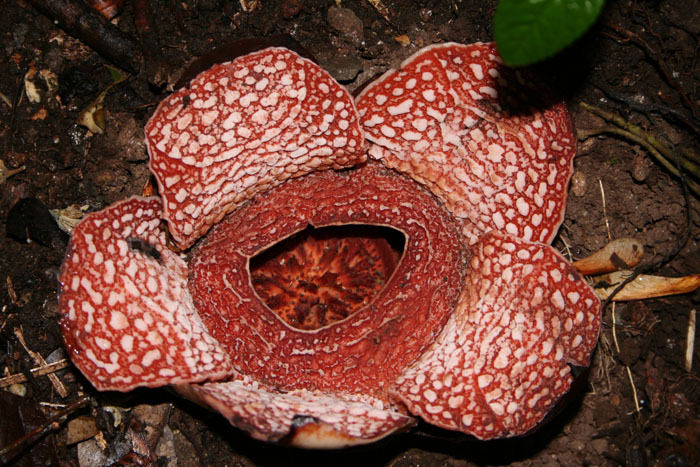 It is one of the small-flowered Rafflesia species, with floral diameters ranging from 17 to 27 cm, thus is similar in size to R. baletei, R. lobata and R. manillana. 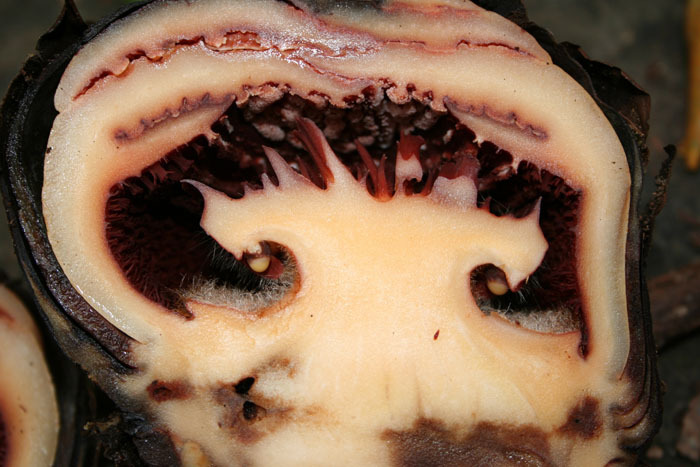 A comparison of morphological features among all Philippine Rafflesia is given in Table 1 of the Barcelona et al. (2009) publication. Newly opened male flower. Photo by Julie Barcelona. Diaphragm opening through which is visible the processes that top the disk. Photo by Julie Barcelona. Column (neck at top, cut in cross section) inverted, looking down at anthers below the disk corona. Photo by Julie Barcelona. Longitudinal section of male floral bud. Photo by Julie Barcelona.